For quickly detaching your camera from its strap, this coyote Standard Camera Sling Strap from DSPTCH offers two sets of different quick-release connectors that secure via round or flat elastic loops for a universal fit on any camera's side lugs. This strap accommodates a mirrorless camera with an attached lens, or any camera that is approximately five pounds. Made in the USA, the adjustable cross-body strap is between 36" to 48" long, and provides a comfortable 1" width. 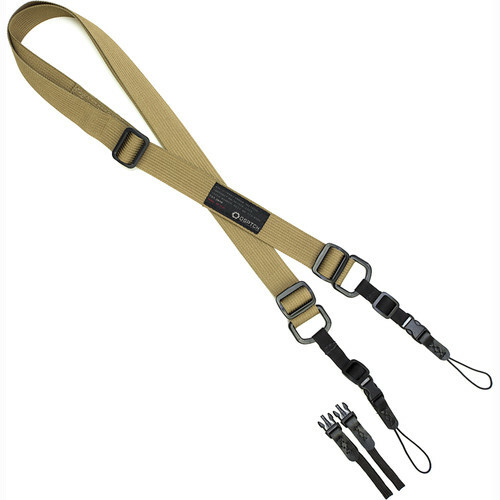 Box Dimensions (LxWxH) 7.0 x 4.5 x 1.0"
Standard Camera Sling Strap (Coyote) is rated 4.0 out of 5 by 32. Rated 4 out of 5 by John from Good Design Good design and very good option for a lighter (e.g. mirrorless) camera. The quick release clips seem durable and safe, and the QR option is great for when I want to remove the strap for tripod use. Strap is reasonably easily adjusted between neck-strap length and cross-body which is how I use it most often. When used cross-body, the strap material slides enough that it doesn't get hung up on my clothes. The strap is wide enough to feel comfortable with my E-M5ii and, say, the 35-100 f/2.8, and I like the slim design as it doesn't take up a lot of room in my camera bag. It would be nice if the strap were a bit more pliable, but that may happen over time. For heavier weights or more extended use (e.g. carrying the camera on a strap all day without a camera bag), I might look at something a bit wider. All-in-all, this strap works very well for me. Rated 5 out of 5 by greg m. from Good strap I was a little bit worried at first about this strap because it has these two clips that you can unclip when using a tripod so the strap doesn't catch the wind. My worry was that they wouldn't be strong enough and sooner or later they would unclip and I would drop my camera. So far so good, I've pulled on it pretty hard and nothing happened so I'm satisfied. I use this strap for a sony a7RII. Rated 2 out of 5 by Ali from Camera Strap Pictures look so much nicer than the actual product. Cheap material. Definitely not worth the price tag. For $$I may consider it. Rated 2 out of 5 by Usually Satisfied Customer from Material is cheap and scratchy. I had read reviews that stated the material was like a seatbelt. I, therefore, was expecting something softer. The material was rough and scratchy. The connectors looked good, but I didn't bother to try to attach my camera as I am sending this back. I'll stick with my tried and true Domke strap. Rated 5 out of 5 by Bryan from One More For The Collection I positively love these DSPTCH straps, both in standard and heavy. I have admittedly more than I need, I like them so much. The quick connectors make swapping them easily (the standard is compatible with the wrist strap buckle as well). My only comment is that some of the patterned (camo, specifically) are a bit stiff at first. The plain ones are pretty soft right out of the package. Rated 5 out of 5 by vince from Light, compact, and sturdy I was initially a little worried that such a narrow strap would become uncomfortable, but it has spent hours worn across my shoulder with no issues at all. For reference, the heaviest camera/lens combo I am using this with is about 790 grams. The strap takes up very little room in my camera bag. The strap material appears to be very durable, and the plastic clips and loops are also of high quality. The quick release clips are not easy to accidentally engage. Overall, no hesitation in recommending this. And it's made in USA. Rated 5 out of 5 by Daniel from Nice strap, especially if you like light/compact gear Top notch quality. I use this with a Nikon Df and some prime lenses (no heavy telecoms). It's very light weight, comfortable to wear, and stuffs into the camera bag really well. The strap also disconnects for when you're using a tripod. Just great. Also eliminated the camera D-rings, so that bit goes away too. I'm very pleased with this strap. Rated 5 out of 5 by Huggins from A fantastic, simple strap Very comfortable, utilitarian strap. Doesn't have the rubbery neck-irritating grippy stuff that comes on so many straps included in the box, it's a very smooth webbing material. Perfect size for a mirrorless camera. It comes with two types of connectors so it will fit your camera regardless of what kind of strap lugs it has. WILL THIS STRAP HOLD A LEICA M AND LENS? I would say yes. It holds my Fuji XT1 with a 35mm (50mm equiv) lens just fine. I did use the thicker mounting straps (the ones that tie to the camera) instead of the thinner string type. Just a personal preference. I'm believe that both types of mounting straps are rated strong enough to my set up but the thicker ones just gi me feels bit more confident. The strap is nice too. Not too thick, yet not too skinny either. A comfortable fit for me. Enough length to carry it long or short (I'm 6 ft tall). I have a Fuji XT-10 camera with 18-135mm lens. With this lens, it is not what I consider to be lightweight. The strap included with the camera is 3/4 wide, seems a bit too narrow. Am considering the DSPTCH standard strap, 1/4 wider seems like it might be just right. Any thoughts on this? I have a Canon 80D with an 18-55 kit lens. Although the camera came with a wider strap, I'm much happier with the DSPTCH standard strap; it's strong, but not bulky. I purchased the (Black Camo) design. It comes with two attachments, one set for lighter equipment and one set for heavier equipment. Hope this helps in your decision. Is it strong enough to hold a Fujifilm X-T1 with a big 50-250mm lense on it? It definitely, people having issues with the connector breaking is because they put the connector directly to the camera without a ring, the tiny metal loop on the camera is sharps and after little use will cut through the connector, you must use the strap rings that came with the camera.